Do you listen to audiobooks and podcasts? Clean Design. Better Control. More Sources. 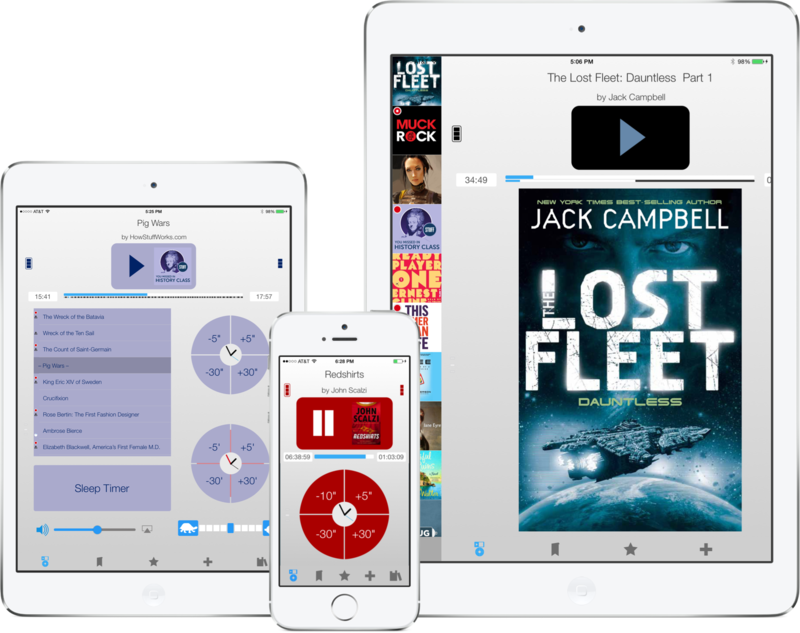 Bookmobile provides a better audiobook experience than any other app. No position scrubber. Sliders are difficult with long audio. If you mis-slide, you can't get back. Bookmobile provides easy-to-control skip buttons. iTunes Store. Audible.com. CDs. The Web. MP3/M4B/ZIP. DRM/Non-DRM. RSS/OPML. Wherever, whatever, Bookmobile supports it. Listen to audiobooks or podcasts while driving? Swipe to Driving Mode, and you never have to take your eyes off the road. Bookmarks are easy to create — just tap Pause. Customize name, color, position and notes. You can export as HTML/CSV/Text. Adjust the playback speed just a little, or a lot. Bookmobile remembers what you like for each book. A little bedtime listening? Use the sleep timer. Shake-to-add-time, auto screen dimming, and it bookmarks when it started and ended. Haven't listened in a while? Automatically jump back a configurable number of seconds to remember where you were. Free, you say? Yes, FREE. Search or Browse through thousands of titles. Add to your Bookshelf and download whenever. iTunes Sync. Direct downloads. Open from Dropbox. iTunes Shared Files. Delete/Rename. Full control of your audio files. Continue using the app while files download. With iOS 7 or later, the app doesn't even have to be running! Switching to another audiobook or podcast is one tap away. Bookmobile always remembers where you were. Bookmobile works great with remote controls, like Bluetooth or Apple headphones. Play/pause. Skip 30 seconds. Bookmark. Because in some ways they're the same, in other ways they're different. Podcasts get special treatment in Bookmobile. Change file/chapter titles, cover and chapter artwork, color scheme, skip button times, and more. It's easy to create Twitter and Facebook audiobook reviews with the cover artwork. Just tap pre-populated fields: title, author, rating, etc..
Bookmobile is a wonderful album player also. Same great controls, same clean interface. Use Launch Center Pro? Try: Bookmobile:// to launch, options: Play, Pause, Next, Previous and PlayPlaylist. Designed for, by, and with avid audiobook listeners. Bookmobile has been refined over years, with input from audiobook listeners who care about their experience.